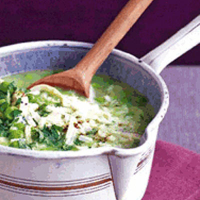 This is a good recipe to cook when you haven't been shopping – you always seem to have some Parmesan in the fridge and there are usually peas nestled somewhere in the freezer. You don't need the chicken but it does bulk out the soup with a bit of protein; prawns or frazzled pancetta work too. This dish is also a clever way of using up the tail end of a pack of risotto rice. Cook the onion in butter in a pan for 5 minutes until it starts to soften. Purée half the peas in a food processor. Add the risotto rice to the pan and stir to coat in butter. Pour in the stock and add all the peas and chicken. Simmer without a lid on for 20 minutes. Season to taste and scatter with the parsley, grated Parmesan and freshly ground black pepper. A thick broth of this sort doubles its warming force with a juicy red. This recipe was first published in Thu Feb 01 00:00:00 GMT 2007.